Maretron?s Cable-Starter-Kit provides all the necessary cables and connectors necessary to connect two products together on an NMEA 2000® network. 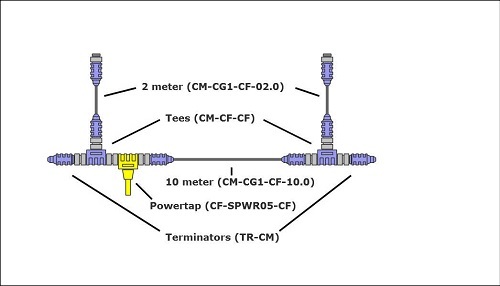 This includes a powertap for powering the products, one 10 meter trunk or backbone cable, two tees and two 2 meter cables for crating branch or stub connections to the individual products, and two terminators for proper termination of the NMEA 2000® network. The network is easily expanded by adding a tee and branch cable for each additional product that is added to an NMEA 2000® network.